Gaztelugatxe is a small islet connected to the Basque coast by only a narrow stone bridge and a winding staircase. Dating back to the 10th century, the island was crowned in the name of John the Baptist and remains a small hermitage with a modest monastery. Two-hundred steps zig and zag up to the top of the mountain where the chapel sits, carving a scenic path visible from the top. The rocky island looks like a castle rising from the sea, which is where the island Gaztelu-aitz or ‘castle rock’ gets its name. The rough waters of this coastline have carved several arches and caves dotting the edges of the peninsula and giving the island its unique, rugged look. This majestic spot is believed to be a former convent of the Knights Templar, as well as a former conquest of Sir Francis Drake. Climb to the top for the best views of the surrounding area. San Juan de Gaztelugatxe is most accessible during the summer months. Bizkaibus service A-3524 departs from Bakio every two hours. The journey is about a half hour. Alternatively, take a taxi from Bakio. Cruise the curvaceous coastline of Bilbao in a luxurious minivan on a guided tour of the city and its sights. See the intriguing industrial areas that propelled Bilbao into prosperity and visit significant landmarks like the Transporter Bridge of Bizkaia and the San Juan de Gaztelugatxe hermitage. 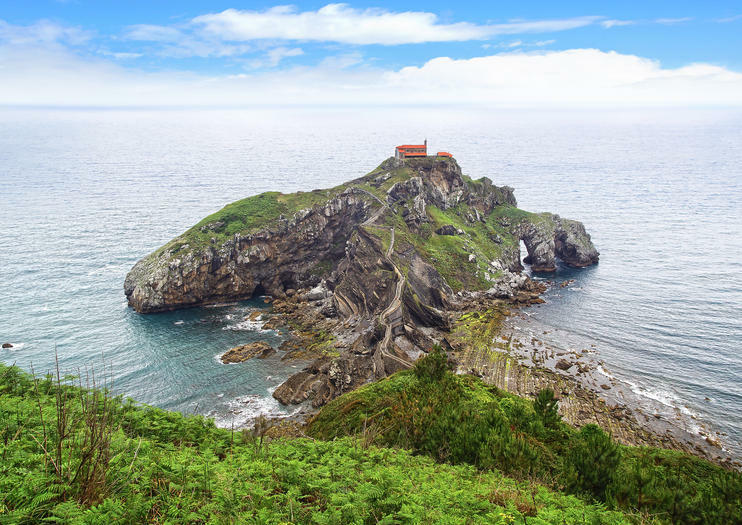 Visit the quaint coastal villages that pepper the Basque Coast and absorb the tranquil ambiance of picturesque marinas on this enriching excursion.